If you’re looking to invest in backyard play equipment with the hopes of providing endless hours of outdoor entertainment, look no further than Growplay Monkey Bars. We provide both climbing frames and monkey bars for kids, to keep them entertained and challenged, all whilst encouraging a healthy and active lifestyle. We provide a range of free standing outdoor play equipment, manufactured from high quality engineered materials, certified to hold up to 660kg in weight! 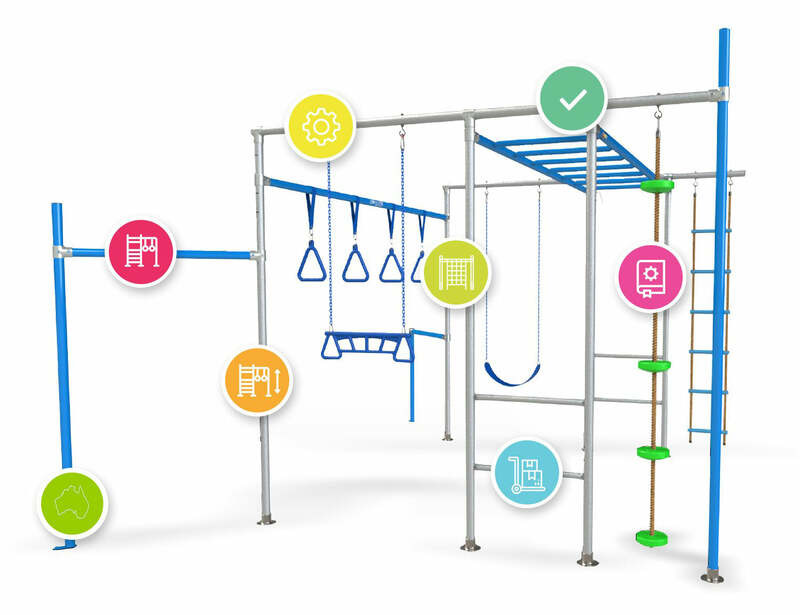 Learn more about why your kids will love our backyard climbing equipment and why Growplay are highly regarded for monkey bars Australia wide. FREE STANDING FREE STANDING Just like a trampoline you can move them around the yard. There is no digging or concreting required. Foot print is 3m x 3.8m and come standard with nine features. HEIGHT ADJUSTABLE HEIGHT ADJUSTABLE Growplay Monkey Bars are height adjustable from 1.3m to 2.1m Making them the perfect height for any age. DESIGNED IN AUSTRALIA Growplay is proudly Australian owned and operated. All our products are engineered locally to Australian standards. DESIGNED IN AUSTRALIA Growplay is proudly Australian owned and operated. All our products are engineered locally to Australian standards. Similar in construction as Funky Monkey Bars. Our frames have a smaller footprint measuring 3.8m x 3m and specifically designed to fit in the average size backyard. The compact design climbing frames are packed with features, making them the best value monkey bars on the market. For more information checkout our FAQ page or contact us directly. This video show cases the endless possibilities with our double frame and extension kit monkey bars. Growplay Monkey Bars provide endless hours of fun in the safety of your own backyard. Our swing sets with monkey bars are a great way for kids to build strength and fitness. In order to tackle the monkey bars, kids need to learn how to hang, twist and swing, which not only builds muscle but translates into the development of both fine and gross motor skills. In addition, our products are all height adjustable, ranging from 1.3m to 2.1m in height! We want to be able to entertain your kids for years on end, so it is important that our products can grow with your kids! If you’re wondering whether we provide monkey bars for adults, as our products are made from high quality galvanised steel, our products are appropriate for all age groups! So long as the weight limit is adhered to, the options are endless! Growplay Monkey Bars also offer kids climbing frames, which can be enjoyed by kids for years on end! Backyard climbing equipment provides kids with both a physical and mental challenge, as they require strength and confidence in order to reach new heights! Our climbing frames are freestanding and height adjustable, providing a simple yet long term solution. Double zinc galvanized rust protection. Independently tested high tensile custom spec tubing manufactured. Looking for accessories for your monkey bars? Growplay Monkey bars offers a great range of high quality and affordable accessories. From Balance Beams, Ropes Climbs, Bouyancy Swing, Boxing bags, Dip bars, Extension frames and Rungs. Did you know all Growplay accessories are suitable for Funky Monkey Bars too! Our products are made from high-quality durable materials to withstand the harsh Australian conditions. 1 Year on powder coat and accessories and 3 years on framework. Growplay Monkey Bars products are certified safe for domestic use. Growplay Monkey Bars are great for both play and for rehabilitation purposes.